An intriguing article by Scott Wood from iNform Health and Fitness entitled, Coffee – The cigarettes of the 21st century, should give all coffee drinkers some pause for thought. Once we all get through the knee-jerk, defensive responses shared by people dependent on all kinds of substances, there are some interesting insights in Scott’s article that illuminate why Baristador was created in the first place and why we should always question how much coffee we consume. What is Scott trying to tell us and how does this all marry with the Baristador approach to coffee? Let me explain. There are three key quotes from Scott’s article that I believe capture the essence of his message to us. The first is that, ‘regular caffeine intake can impact negatively upon our physical health.’ Scott tells us that the extra acid that the presence of caffeine triggers in our stomachs leads to ulcers, while the continual stimulation of our adrenal glands leads to ‘adrenal fatigue’. His point is that coffee with full caffeine content throws our body into fight or flight mode while we are often sitting on our ‘backsides’. This can only go on so long before doing damage, including throwing our sleep cycles out of whack due to caffeine’s fight against ‘adenosine’ – the ‘hormone that helps regulate our sleep cycles’. 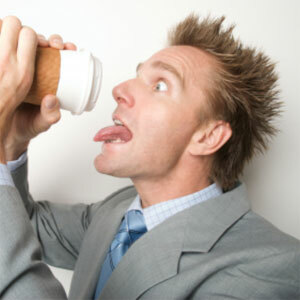 You don’t need that morning coffee to charge yourself up, you need it to feel normal. Isn’t that what long-time heroin users say about their addiction?! Much to Scott’s lament, his clients are quite dismissive of the impact of caffeine on their health and he acknowledges that people appear to affected by caffeine to dramatically differing degrees. How good is your digestive system? If your answers are an emphatic ‘fine’ or ‘excellent’, then your system seems to be coping with its caffeine intake, at the moment. If not, Scott suggests laying off the coffee for a couple of weeks to see if either facet of your health improves. What Scott doesn’t realise (but we do) is that another option is to tone down your caffeine content while still enjoying rich espresso by switching over to Baristador B70 (with 30% less caffeine than regular espresso), Baristador B30 (with 70% less caffeine than regular espresso) or Baristador B01 (almost negligible caffeine content). I have long consumed my B70 but of late I have been drinking B30. I even serve it to guests without telling them and nobody has ever noticed the ‘lack of caffeine’. Personally, I think this is the smart way to wean yourself to a lower intake of caffeine, allowing your system time to clean up after its ‘habit of poison’ with few, if any, side effects. Nice post Steve. Sharing a combination of Scott’s perspective, but also your solution to the dilema, I have been enjoying either your B30 or a full quality decaf (yours among others!) for some time. I have realised that as a ‘long-since-desensitised’ coffee drinker, I am most often well satisfied by the making and drinking of a good decaf coffee. This still fulfils the ‘ritualistic’ component as well as the social aspect. Everything apparently makes us an addict these days, coffee is just another thing that is added to the list because no medical scientist can prove it’s attributes one way or the other. Shame we’re not allowed to simply enjoy it. I feel what you are saying. At the same time, I think that sound science needs to be taken on board in our lives, otherwise we’re just holding our hands over our eyes like my four year old and saying ‘you can’t see me’. At the end of the day, all things in MODERATION seems to be a sound approach, while being mindful that any addiction is something that weakens us. Having said that, I do have my three espressos of B70 each day – that’s my blend with 30% less caffeine than usual. Given the taste is still superb, I figure that every little bit helps. Thanks for having your say, I do appreciate it.